Home / Opinion / Analysis: Without new state money, is it still school finance reform? Two of the most expensive ways to make Texas voters happy just happen to be the top priorities of the state leaders and legislators assembling next week in Austin. The state’s school finance system is out of balance when it comes to raising money for education, and out of date when it comes to distributing the money it raises. It’s expensive to re-balance — even when overall spending remains the same — because it pits one set of taxpayers who’ll be paying more against others who’ll be paying less. And lowering property taxes — a closely related but different financial puzzle — is both expensive and elusive. Most modern attempts to cut property taxes have cost the state a lot of money and left most property owners wondering why the advertised savings never appeared. Texas’ school finance solution might not be about spending more money, though that was one of the recommendations in a new report from the Texas Commission on Public School Finance, formed to recommend a top-to-bottom rewrite of the state system for funding public education. If there’s already enough money in the system, then the solution may be redistributing it more equitably. That redistribution, however, is expensive. The state has to raise money on its own if it wants to replace what is currently being raised from cranky property taxpayers. And the state has to figure out who will be the winners and the losers if spending formulas are adjusted, as those “adjustments” mean spending more money on one set of students and less on others. 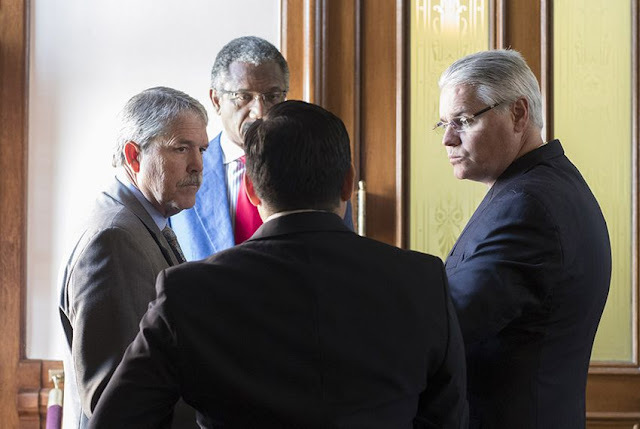 Even so, the plans advanced so far for public school finance in Texas, as ambitious as some of them are, remain cautiously vague when it comes to sources of new money. In its final report, that commission said it wanted to: balance local and state funding for public schools; to rework “outdated or otherwise inefficient allotments, weights and programs;” to increase equity in schools “with significantly greater investment in low-income and other historically underperforming student groups;” to reduce the growth of property taxes and reliance on the so-called “Robin Hood” system that moves money from wealthier districts to poorer ones; to encourage adoption of “data-informed best practices” and to immediately spend more money to do it; and to increase per-pupil funding in the future based on the results of those practices. Even if not one more dime is spent on public education in Texas, leveling the fundraising load would force the state to raise more money. The last rebalancing, in 2006, put the state and local shares of public school spending at about 45 percent each, with the other 10 percent coming from the federal government. Now, the numbers are 55.5 percent local and 35 percent state, with the rest coming from the feds. Roughly speaking, it would cost more than $11 billion to balance that, an amount that would require the state to find that much money somewhere — kind of an early Halloween for some set of taxpayers — in order to lower school taxes for property owners. It is a financial problem, but it’s also a political one. That local money is raised from property taxes. Texas has the sixth-highest property taxes in the country, according to the Tax Foundation, a Washington, D.C.-based think tank that tracks state and federal tax issues. Property owners vote. Voters are screaming at the state’s politicians to ease the load. One reason state leaders want to cut property taxes is to make those people happy. But it’s a lot to ask: Those same elected servants fear how their masters — you — might react if they increase other taxes to offset cuts in property taxes. The formula changes are problematic in another way. It costs more to educate some students than others, and state funding for school districts is adjusted to take those differences into account. Changing those outdated adjustment formulas without new money inevitably means spending more on some students and less on others. That will ripple through each school district in a different way — and those ripples will be noted in advance by lawmakers trying to figure out what the changes will do to their schools at home. It’s as tricky as the property tax part: expensive to tinker with, and fraught with political risks for politicians who are trying — whether you believe it or not — to produce a great public school education for Texans for as little money as possible.